De La Soul are exceptional. 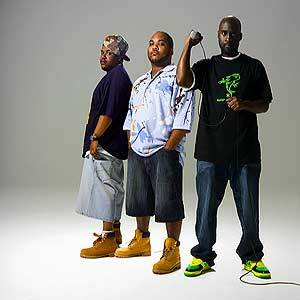 Having had a strong grasp on Hip Hop since '89, the trio composed of emcees Posdnuos, Trugoy and DJ Maseo continue to provide the world with quality music today in 2004. 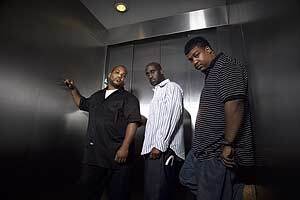 With "The Grind Date," the group's first album on Urban Sanctuary Records, the trio re-affirm that they remain one of Hip Hop's most important and influential groups. MVRemix: Today's the day, are you optimistic Bush will be out of office? Posdnuos: Hopefully. I mean, at the end of the day man it's even beyond that. I mean hopefully at the end of the day where there's a lot of people who have a great power to help play a part in deciding where this day lies, went out and did what they're supposed to do. MVRemix: Have you yourself voted or will you be voting later? Posdnuos: I had to do an absentee vote. But yeah, I voted. MVRemix: Ten years ago did you envision De La still being as strong as they are today? Posdnuos: Quite honestly I did. I never thought that when I was blessed to be with my two partners and come out, I never thought that there was a moment when you wouldn't be liked by people no more. Or people would find you not to be "new." So I always thought that once you were out... and I was looking at other music that I was blessed to be influenced by like Rock music where you see L, Smith and David Bowie always changing the way they were and are still around to this day. I had no doubt that it could happen and to then see that a lot of groups that I started out with aren't respected today and aren't remembered. So the fact that we can still be here is a blessing. MVRemix: I was going to ask you about that because people like the JB's and Dres of the Black Sheep were amongst the shout outs as "The Grind Date" began. What are your thoughts on the fact that those quality artists are still working hard but comparatively ignored to less talented groups which gets major airplay? Posdnuos: It's even beyond groups that are less talented. It just helps you understand that unfortunately talent doesn't mean that people are going to appreciate what you're doing. What I always try to get people to understand is that people have to pretty much know you exist to know whether you're good or not. I think that's the problem. There's a lot of groups that have great talent, but they may not have the right manager that's gonna get them on the right show. I mean it's crazy to think of it like that but there's a lot of behind the scenes stuff that makes the in front of the scenes stuff happen. When you have people that have great talent, they may have so much layering that no one doesn't know how to market them. There's someone you consider less talented, but they're just simpler. It's easier to understand or they look handsome or they look beautiful, so girls can fall into that immediately. Or men can fall into the woman's body immediately and then the lyrics come second. That's the stuff that people have and there's a lot of talented people that may not have that going for them. There's just a lot of other factors that come into it beyond just being talented. MVRemix: Sort of sparking off of that with regards to image - do you have any thoughts on Guerilla Black? Posdnuos: I don't know. I don't know him. I just honestly met him briefly for the first time a couple of weeks ago in Atlanta. We had a show out there and he had a release party in the same building. To sit here and lie and say I'm into his stuff... I couldn't do that. It's a little unsettling that he sounds so much like Biggie. But like I said, for his own defense - I don't know him. He could have had that voice first; he could have did it first. All I do is look at things throughout my own eyes. If I'm crafting a style and someone by the grace of just luck or they stole it from me do it first - I wouldn't do it. That's just me, but I can't judge him on that. At the end of the day, he's another brother of colour tryin' to do his thing. I wish him the best. And I can't front on him as far as beats. I mean, he got Jazze Pha, he got a lot of cats behind him. I love the beats, but to say that I can really get into him is hard because he sounds just like Biggie. MVRemix: Because of the released of "The Grind Date," everyone's wondering will "Art Official Intelligence 3" ever make the light of day? Posdnuos: Yeah, hopefully soon man. It's just due to us changing homes as far as where we put out our music. We thought it might not have been a good idea, and not fair action, actually, to give the new label that we're in business with to give them a DJ album. I think Tommy Boy, which was our home for nearly fifteen years, they understood that that was a part of a trilogy that they were part of. But to now go into a new situation and then say "Hey, thanks for this new situation you've gotten into with us. The first thing we're gonna do and you're gonna promote is not gonna really have Pos and Dave rhyming, but our DJ and it's an instrumental." It would've been wrong. So we had to give them a straight forward De La album, which we did, which was "The Grind Date." But we do look forward and plan on putting out this trilogy, and hopefully with our new home. Or if they feel that they don't want to go that route with it, we'll put it out via the internet, through our site or what have you. But it'll be out. MVRemix: It's hard to compare "The Grind Date" to previous De La albums. Many state you "changed" the formula to fit in with today's audience. Is there any truth to that? What was the mind state behind the creation of the album? Posdnuos: It saddens me when people say things like that. It doesn't anger me, but it sometimes shows... the only way I can say it is ignorance. Ignorant doesn't means stupidity. It just means you ignore facts. Change is good, it's all about where you're changing to. Everything needs to change and I think what people, even with De La fans could fail to understand is that De La Soul always changed. We changed from "3 Feet High and Rising" to "De La Soul Is Dead" to "Buhloone Mindstate" to "Stakes Is High" to "A.O.I." We always change. We are, and I'm so blessed to say that we have remained to be students of Hip Hop. So, no different from being a student of Hip Hop back in the day and loving Rakim and different other acts, still doing things the way we wanted to. We're still students of Jadakiss and Black Thought and Lloyd Banks, but still doing things the way we want to. So if we are blessed to have someone who can get into our music who was down with us since '89, or someone who can get into our music that has been down with us since "Stakes Is High," or someone just to this day - I feel one of our best ingredients is that we're open to change and we are open to what really goes on now in the present. That's what "The Future," that first song says, "We are your past, present and future." We are not one of those groups that gets stuck in the fact that we were so successful in '89 and had this life altering album that we have to stick around and only make music like that.